Another day, another home haunt update to catch up on. Today’s trip takes us to Orange, to a neighborhood where the spirit of trick or treating and the fun of Halloween is alive and well, and one man has taken his lifelong love of spooky haunts and provided a cherished tradition for the neighborhood. Dave Larson has been haunting since he was a child. Back then, in the 1970s, he was a creative child taking over his parents’ garage during Halloween to create a little haunted walk-through for Halloween night. But these days, his ambitions and creations have grown greater, more polished, and more spectacular. 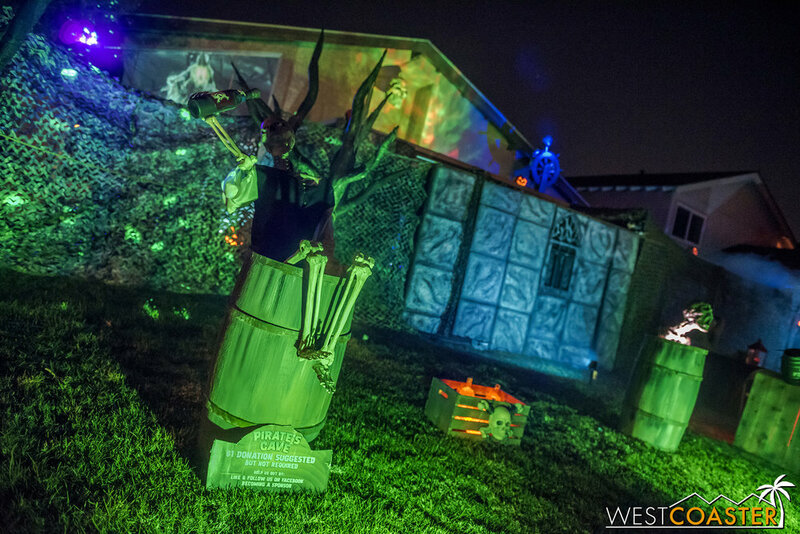 The Pirates Cave is the result of nearly two decades of yard displays and home haunted houses that have slowly grown year by year, becoming more sophisticated and technically complex. The front yard of The Pirates Cave sets the tone for what to expect inside the attraction. It first began in 1999, when the Larson family moved into their current home on Garfield Avenue. Dave’s wife bought him a pirate figure piloting a rudder, which presented him with a “problem” of how to feature it. The very first year featured a modest yard display, but little by little, it grew and grew. Expanding the pirates theme—one developed well before any of the Pirates of the Caribbean movies ever came out—Dave built up a series of scenes, growing more dynamic as the years went by. Today, The Pirates Cave Haunt is very much like a spookier and slightly scarier version of Pirates of the Caribbean. It’s kid-friendly, though there are startles and pop-out scares. However, everything is clean and family-safe, without blood and gore that marks many other home haunts. The intention is to provide a safe, old-fashioned type of Halloween fun without being overly intense or potentially traumatizing. And to that end, The Pirates Cave accomplishes the goal with spectacular colors. 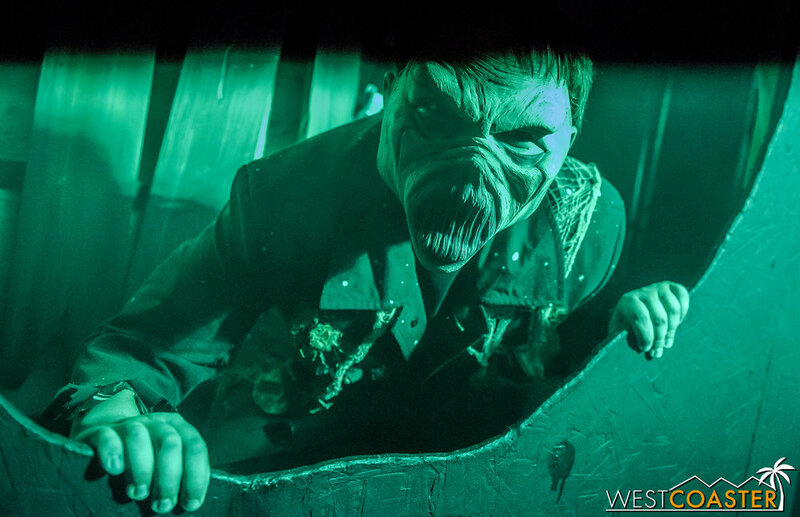 An animatronic skeleton provides the backstory to the maze. The haunt itself is a little bit on the short side, layout-wise. There are several rooms, spread across the front lawn of the Larson suburban property. Everything starts with the impressive yard display out front, which is sumptuously lit in theatrical lighting and features several boney pirate animatronics. A few tombstones and a stony facade complete the look, while some projections on the actual house facade beyond add depth to the scene. Immediately from the front yard setting, The Pirates Cave establishes its eerie tone—one that also beckons with the mystery of adventure! An old treasure seeker’s remains can be found in The Pirates Cave. The line extends down the sidewalk across the property, and entry is up the front garage driveway, into a first room that features a cool little preshow warning guests of a cursed treasure and undead pirates whose touch will reduce mere mortals to bones, just like the talking skeleton delivering the news! 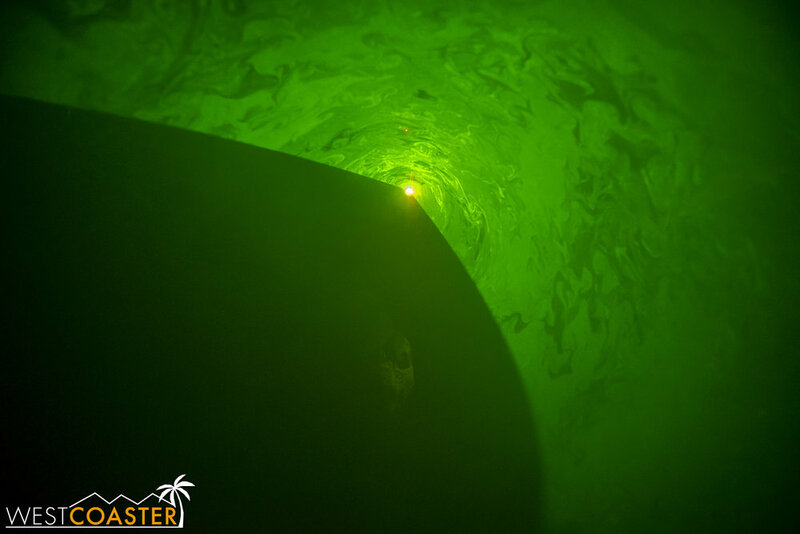 The lights blink out, and then a pirate backlit by strobes appears from a hereto hidden cavern! He bounds against an invisible barrier, trying to get in, and with another brief interlude of darkness, he succeeds! Guests are left to scurry onto the next chamber before they meet the same fate of the pirate! What follows is an unstead traverse across a shaky bridge, through a moody, green-lit passageway and into a gloomy chamber. Here again, a ghost apparition appears. The bravest of the group is instructed to press a red button to a chest that supposedly contains treasure, but instead, more pirates ambush! The scares come from a couple different directions, before everyone escapes out a side exit and back into the secure world of Orange County—but not before a couple more ambush scares! Oh no! The curse on the treasure still stands! The Pirates Cave is a succinct but wonderful production, with a cast of talented monsters consisting of Dave’s kids and their school friends. It strikes a great balance of “scary but not too scary,” allowing the mainly school-aged audience to enjoy an enchanting and briefly chilling encounter with supernatural buccaneers in a vivid and immersive environment! It’s a treasure for the local community too, having thrilled visitors for many years. This was the first year that Dave publicly advertised his haunt (I found it via the SoCal Haunt List), and the exposure seemed to drive up attendance a good amount. Fortunately, Dave’s neighbors seem to be very tolerant of his Halloween enthusiasm, and the added traffic and popularity has enhanced the Halloween atmosphere more than detracted from it. Captain Dave poses proudly in front of his creation, which he builds and runs with his family, at The Pirates Cave! The Pirates Cave Haunt is a lovely gem of a home haunt and was open Saturday and Sunday on the last weekend of October and Halloween evening. Located on 2548 E Garfield Ave, Orange, CA 92867, it featured free admission, though a $1 donation (or more) was gladly welcome to offset the basic costs of running the attraction. 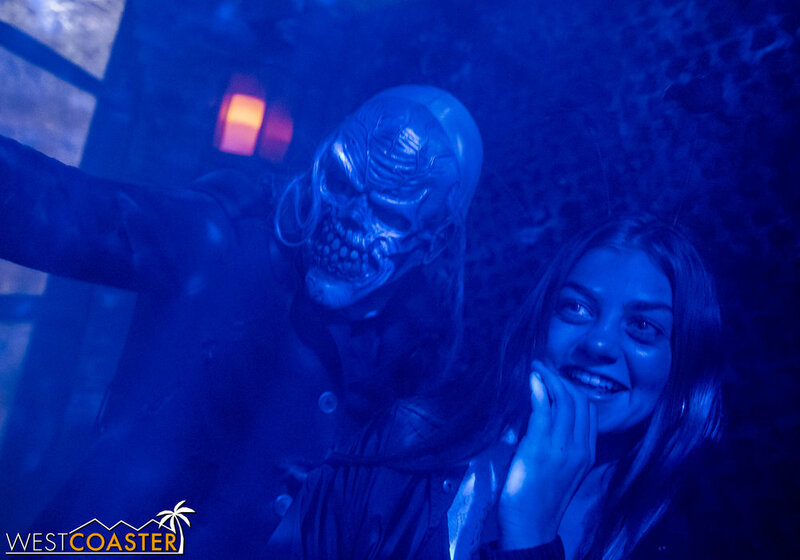 It’s a great haunt for guests of all ages, and it really captures that lively, entertaining spirit of Halloween that makes places like Boney Island and Ghost Train so universally appealing. We can’t wait for The Pirates Cave to reappear next year. It’s simply too appealing of a jewel!